For several years now we have been hatching moths. We regularily find fat green caterpillars in our garden eating the flowers of our spring flowering bulbs(the name escapes me). This year we found them in late March. We take it indoors and feed it lettuce until it goes into a chrysalis. 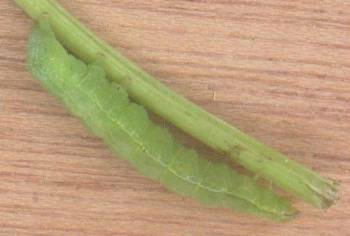 We have also found several caterpillars on organic lettuces from the supermarket. It takes longer than the 2 weeks normally recommended to hatch. Our latest one took 4-5wks. We were disappointed to find it was a moth but it was beautiful none the less. We have had difficulty identifying it so next time we find one we will take more details. It could have been a Silver y or a Cloaked Minor. We have been hunting for more on stinging nettles and dock leaves but so far they have evaded us. Perhaps the cold and long winter has delayed everything. We will keep looking. Julie says: Thanks for sharing Dean. I think moths are beautiful too. We have only found one small caterpillar so far this year too - it was very small so we left it where it was. Hoping to find more now that the weather is getting warmer. Comments for It was a moth!!!! Wow!!! You are doing this in a big way but I am doing this in a small way. I used to take those caterpillars inside my home. And I grow them. Once they are about to grow into full-grown moths I set a camera and capture the whole moment. So cool! We are all looking now!